Originally called Dunleary from the Irish Dun meaning a fort belonging to a Gaelic chieftain of the clan Ua Laoghaire. Arthur Young, in his Tour of Ireland relates how he embarked at Hollyhead on 19th. June 1776 and arrived next day on board The Claremount at Dunleary. A hotel and coffee-house flourished at this place. Granite stone had to be quarried all over the foreshore from Dunleary to Dalkey and from the hills running down to the sea; enormous stones were cut and placed in position to build a gigantic half-pyramid style wall of width 63.5 metre at the top reaching 1,350 metre into the sea on the eastern side of the small old Dunleary harbour. So much damage was done to the foreshore by the blasting of rocks, as can be seen by the jagged edges protruding below the Fortyfoot, that one might imagine the workmen taking their revenge out on those rocks for all their collegues and family members lost by their presence as they,hidden under the raging waves, tore stranded boats to shreds sending many sailors to a watery grave in this 'haven, which besides its shallowness,hath yet another great incommodity, that the ships have hardly any shelter there from any winds, not only such as come out of the sea, but also which come off the land especially out of the south west'. This irish equivalent of the pyramids was completed in four years; in time for the visit of his majesty King George IV (1821) and the occupying british authorities at the time showed their appreciation to the builders by angloising the name of their town to Kingstown. There might have been less than an altruistic motive for London financing such an undertaking so soon after the 1800 Act of Union establishing the United Kingdom and abolishing Irish government. The reason may have been to provide a safe landing for the mighty british navy in case of any attempt by the Irish to secede from the forced Union. Later the harbour was enclosed by a narrower-32 metre but longer-1,750 metre wall on the west side leaving an openning to the sea of only 240 metre and providing the largest and safest harbour in Ireland,consisting of an one square km. sheltered haven for commercial and pleasure sea-faring liners. 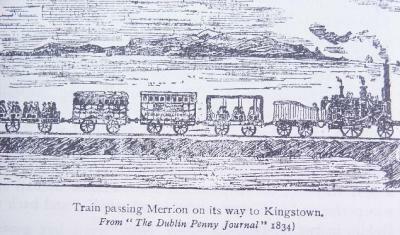 Within ten years of the harbour being built, the first irish railway line was opened between Dublin and Kingstown, making one wonder were the workers of those times men or giants, having had to reclaim so much of the sea and blast away so much rock to open the way. Hurried by the invisible but stupendous agency of steam, the astonished passengers will now glide, like Asmodeus, over the summits of the houses and the streets of a great city - presently be transported through green fields and tufts of trees - then skim across the surface of the sea, and, taking shelter under the cliffs, coast along the marine villas and through rocky excavations, until he finds himself at the centre of a vast port, which unites in pleasing confusion the bustle of a commercial town with the amusements of a fashionable watering place. After Ireland got its independence and the ports were no longer under british control, the town took back its original irish name of Dun Laoghaire. The pier and the railway line between them took over almost the whole southern coastline of Dublin bay leaving the people with very little access to the shore. 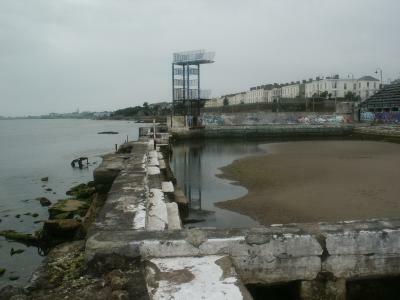 However, the Dublin Authorities at the time took steps to ensure that there would be some beaches left in their natural state for the use of the general public. Right at the start of the East pier a little natural strand of about 200 metre was fitted out with piers, breakwalls, seating and stairs for the sea-side pleasure of the people. Interestingly, the Ordnance Survey map shows this little area to be the only public land to be adjacent to the sea, uninterrupted by rail or road on the whole south coast from Irishtown to Dalkey. 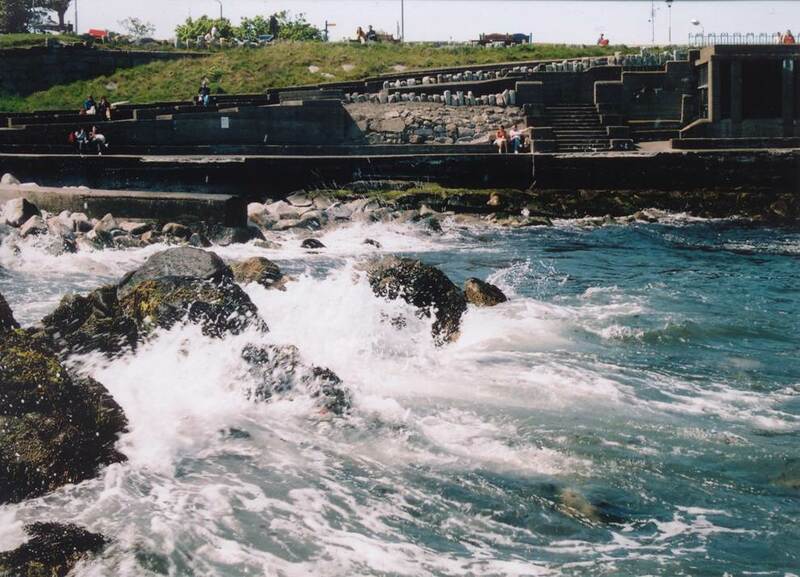 For some strange reason the Authority now charged with the upkeep of public places in Dun Laoghaire, has seen fit to have this, the only natural beach in their area, vandalised and turned into a virtual rubbish tip by the depositing of boulders into the bathing area and the accumulation of debris which is never removed. "This is a noble village, situated about three miles from the north east corner of Stephen's Green , on a rising ground south of the bay of Dublin; it consists of a considerable number of elegant country houses, and in summer is much resorted to by the citizens for the purpose of bathing. In fine evenings it is as much crowded with carriages as the most populous streets of the city; and as there are a number of genteel families residing here at this season of the year; they have drums and assemblies as in town, whereby it is very sprightly and agreeable to such as have nothing to do. "_ _ _ Hibernian magazine 1783. "There are some very neat cottages on the road, the thatching of which is the very best of the kind I have ever seen, and although I had heard much of the neatness of these buildings, they far exceeded my most sanguine expectations. but could find nothing more than a dark coloured limestone crag, just peeping above the surface near the water's edge. "_ _ _Honorable Irish Society of London - 1825. Enlivened, particularly at a time of bathing, with numberless carriages of various descriptions, from the well-appointed equipage, at once convenient and superb, down to the jaunting car of passage, drawn by one miserble garron, so ill-fed, so ill-groomed and lean, that it would appear to be scarcely capable of hastening its own demise by an effort towards speed of foot....the sole inducement to visitants is the facility of bathing on the soft and gently sloping strand. At Booterstown the fields are disposed in a style of judicious husbandry, the villas are neat and commodious. , and thereupon affirmed that he knew it to be his resolution to carry himself with tenderness towards me." Among the craggy, rocky, precipitious coast-line between Dun Laoghaire and Dalkey on the edge of Scotsman's bay is the little cove of Sandycove,an oasis of sand among the rocks, around which a pier was constructed for the life boats in the olden days; nowadays the enclosed beautiful sandy beach, is a haven for swimmers and sunworshippers all year round. By contrast the adjacent Fortyfoot bathing place is situated on the most treacherous point, which does not deter some hardy souls from swimming in its waters every day of the year. Dalton in his History of Dublin (circa 1400). In 1451 the King appointed James Prendergast as baliff of Dalkey to receive all customs and dues, payable to the municipal authorities of Dublin, arising out of the sale of wares and merchandise at the fairs of Dalkey, of which seven were held each year; such proceeds to be applied towards the walling and paving of the streets of Dublin for which Dalkey was then the port. At around this time seven castles were built for the storage of the merchandise and as a defence against the native mauraders,of which only two are extant. 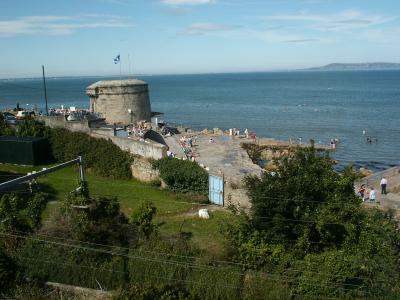 In 1538 Walter Cowley landed at Dalkey from Hollyhead with two hampers of treasure given for the King's service in Ireland; and in the centuries that followed many more noble English aristocrates, sent to subdue the Irish, arrived through this Collimore port protected from the sea by Dalkey island and from the natives by Dalkey Hill and castle. 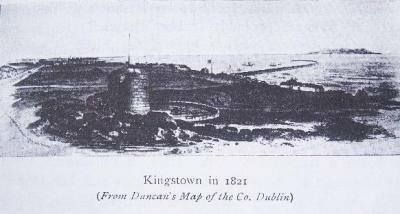 In 1834 a gold rush started at Dalkey, perhaps because of the golden colour of the granite which had been mined for Dunleary pier, but no gold was found in 'them dar hills' of Dalkey; however much gold was earned in the subsequent land craze with the coming of the first railway in Ireland and Dalkey was transformed from being a poor village to a prestigious township. In 1575 Dalkey island became the refuge for citizens fleeing from an outbreak of the black plague in Dublin; but, although it is well endowed with fresh-water springs it has very little pasture and is too windswept for a comfortable life. It quickly reverted to nature and a home only for sea-birds; being only 250 metre by 500 metre in area and about 300 metre from the mainland and with no building but a ruined church said to be built by St. Begnet. A large marquee was erected on the island for the King and his Officers while the commoners paraded around in gay attire, the ladies in white with green silk bonnets and the men in their Sunday best; there was singing and dancing to the musicians in attendance and a great time was had by all until late into the night. For the Collimore boatmen, it was said to bea windfall earning them enough 'to keep them in idleness and inebriation' for a long time afterwards. The british, considering this to be a strategic island, which Napoleon might one day occupy, had one of their famous Martello towers built on the island, presumably before they sent him to Elba, not much better by all accounts.